You can hire any of our available exhibitions for FREE! Below is a press release for the project, written by our Communications Officer, Dawn Gorman, and featured in the Blackmore Vale Magazine. *The text is a direct copy from the article. One correction to be made is that in most cases the exhibition will need to be picked up by those wanting to host it. Only in mitigating circumstances may it be possible for an exhibition to be delivered to a venue. Do however get in contact if you are unable to collect it, we may be able to assist. Community groups can now hire one of a series of exhibitions focusing on the impact of the First World War on Wiltshire communities – free of charge. The offer, from the Wiltshire at War: Community Stories project team, is available until 2019 for all community venues, including village halls, libraries and museums. The exhibitions would make an ideal backdrop for any First World War project, talk or event in a public venue, and have been specially designed to fit flexibly into any space. 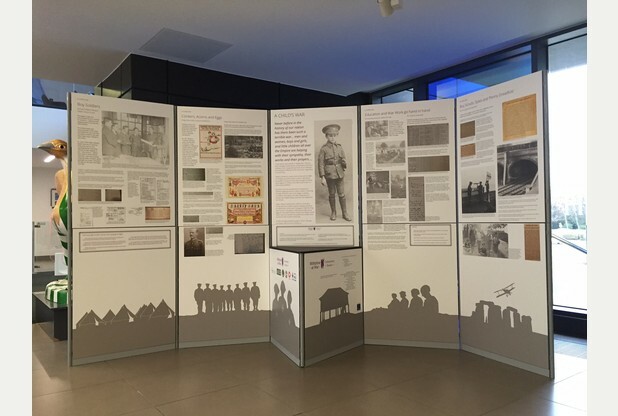 The exhibitions take the format of a series of well-researched information panels covering various aspects of First World War in our local communities in words and archive images. The research has been carried out by local museums and heritage groups from across Wiltshire as part of a Heritage Lottery Fund supported project. There are five exhibitions in the series. The first three are available for hire now, with two more to follow over the next year. The first, The Call to Arms, tells the story of Wiltshire’s response to the First World War through the mobilisation of troops and the development of camps and airfields across Salisbury Plain. It presents true stories of Wiltshire people, from the men and boys who answered the first call to join up, to the regular soldiers who learned to fight a new kind of war involving digging trenches and firing mortar shells. Wiltshire Does its Bit, the second exhibition, looks at the responses of people in towns and villages throughout Wiltshire to the declaration of war, telling stories of the farmers who fed the soldiers and the sick, the women who worked in the munitions factories and the village businesses that prospered from the camps on their doorsteps. Stories of local characters are told in detail and include archive photos. The most recently launched exhibition is A Child’s War, which tells how local Scouts and Girl Guides were recruited to guard railways and work on allotments, how boys filled roles vacated by absent fathers and uncles, how some boys managed to enlist by lying about their age, and how unusual Government orders demanded that children collected conkers and acorns for the munitions factories. The two further exhibitions available for hire in the coming year will be Keeping the Home Fires Burning and Peace and Aftermath. An important element of the exhibitions is an interactive iPad, enabling people to view and listen to extracts of oral history interviews with people living in our communities today, who told the Wiltshire at War team their stories from their families and wider communities about the impact of WWI locally. *The Wiltshire at War: Community Stories team is able to arrange for the delivery of any one of the exhibitions to your venue if required, but each one will fit into an ordinary hatchback-sized car, and the kit comes with a trolley for easy transportation. The exhibitions can be displayed as a single panel section or split up into smaller units – and even wrapped around pillars if space is tight. It takes two people just one hour to set any of them up. All that is needed is one plug socket for the iPad. To book any of the exhibitions, or to find out more, please call Heather Perry at the Wiltshire and Swindon History Centre on 01249 705500. ← Wiltshire at War: Community Stories – an Update and a Call to Arms!